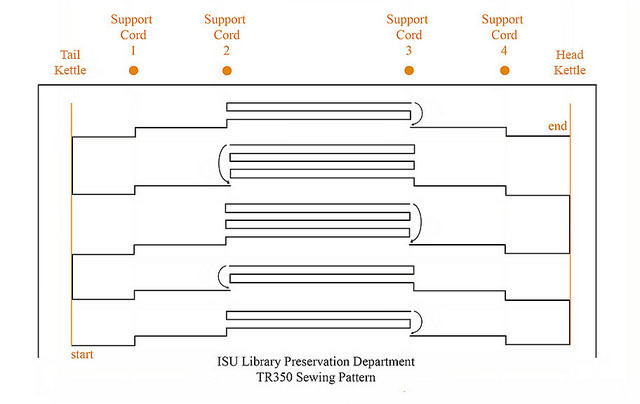 The repairs we do on books in the Preservation Department is something that many might think seems really complicated or something super scientific. However, the work we put into books up here on the 4th floor isn’t all as complex as it appears to be and can be related to hobbies done outside of the Preservation Lab. Personally, I really enjoy putting together puzzles. In some aspects I can relate this enjoyment to the work I do in Preservation at the library. Most recently, I have been working on a book repair technique called a reback. A reback is done when the spine of the cover is damaged, but the rest of the book is intact. Books that need repairing like this are what I would consider a puzzle that’s put together, but not quite finished. A damaged book needs something more – a few more pieces – to make it look complete. When working on a puzzle, sometimes you take a few pieces out that had already put together to get a closer look and find which pieces match with it. A similar approach goes with the books I have been repairing. You take off the damaged bookcloth and replace some of it with new bookcloth. Then you put the final “piece” back on – the title – and the book looks complete. Once all the parts are together the book is finished and can be put back on the shelf to be used. 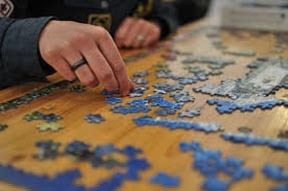 In a similar way, once the pieces of a puzzle are all together, you can see a full image and sit back to enjoy it. 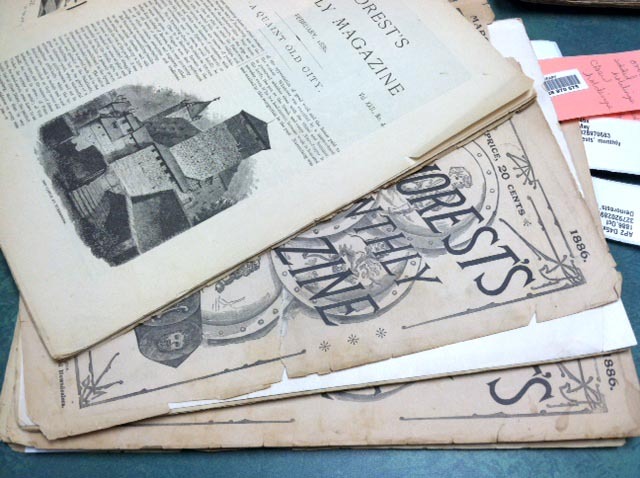 During my first week at the library, I came across some 19th century periodicals that needed treatment because they were requested for a class. 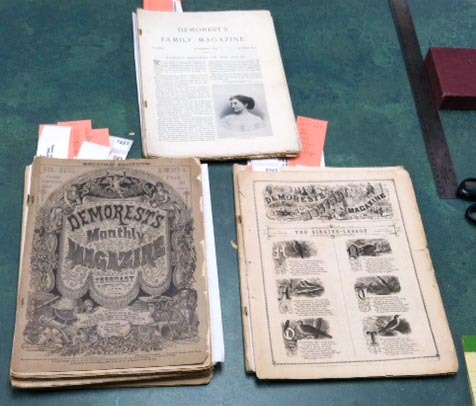 The magazine is called Demorest’s Family Magazine. 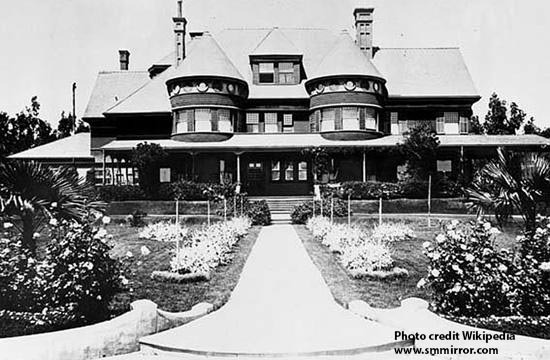 The issues that I am dealing with are from 1871 to 1893. 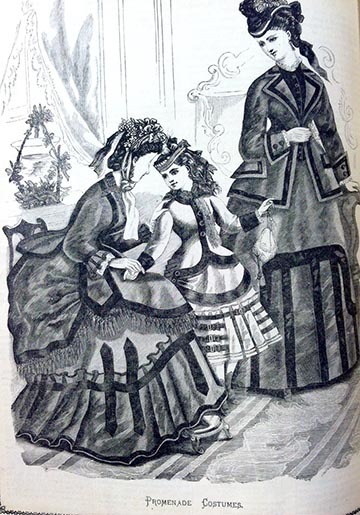 As an occasional reader of Parents magazine in waiting rooms, break rooms and at home, my interest was piqued as to what a family magazine used to look like at the end of the 19th century. Moreover, as I was examining one of the issues, I found a small piece of stationary that had been used as a bookmark. 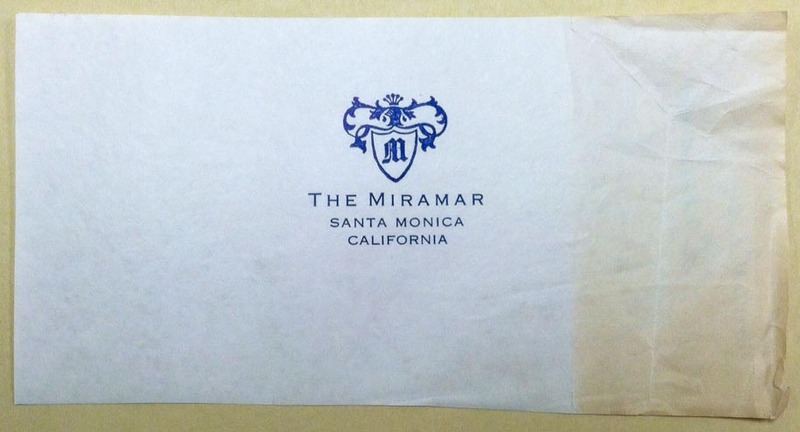 On it was the logo of the Miramar Hotel in Santa Monica. 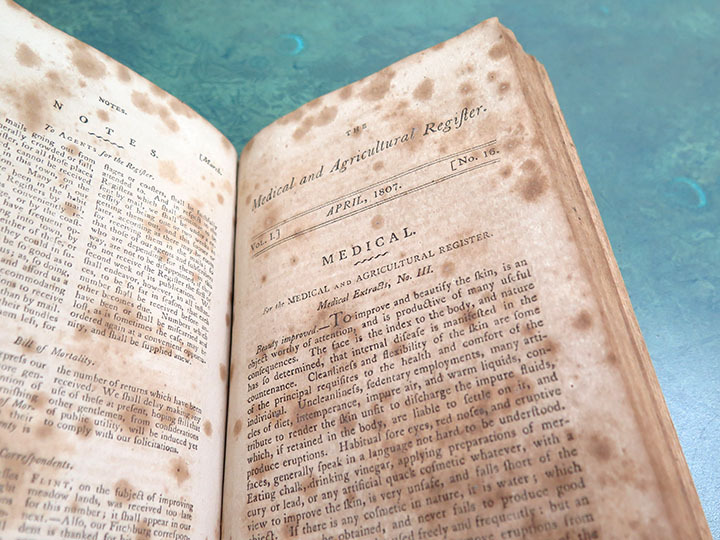 The discolored portion of the stationary on the right hand side had been sticking out of the magazine, thus exposed to wear and tear, UV light and environmental pollution. 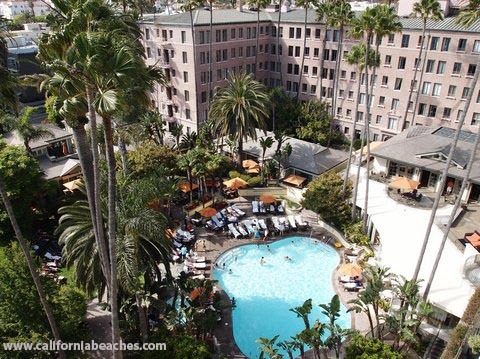 Since I had just moved from the LA area the previous week, this seemed like a sign, so I decided to put this item on the Parks Library Preservation blog. But I very much digress here, which is one of the guilty pleasures of looking at original objects “in the flesh” – so many associations spring to mind. Now imagine if I was an academic scholar and if this flow of information was a stream of original research ideas based on interactions with unique special collections materials! Peer reviewed articles would be flying off the press. Fancy a walk in the park, dear daughter? 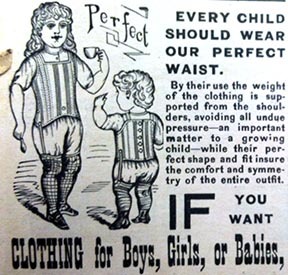 Finally, a way to make your children perfect! Publications like this one were often printed on thin wood pulp paper, which was not made to hold up to the test of time. Unsurprisingly, the paper had become brittle, with numerous large and small tears afflicting the pages and the covers. In order to make the item ready for viewing by a group of students or for digitization, some stabilization repairs will need to be performed. These will include reattaching covers and loose pages and mending the more significant tears that could cause further damage upon handling. 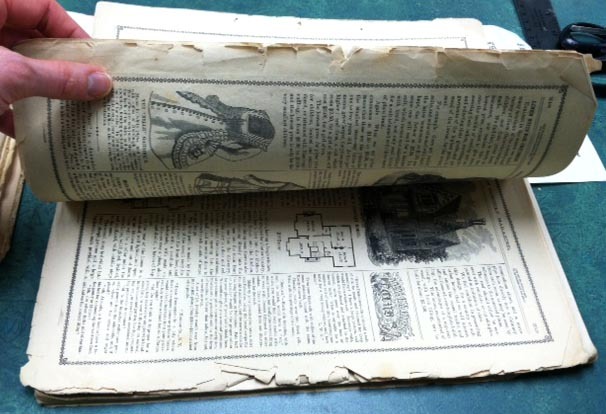 When making repairs to thin brittle paper, it is especially important to select a mending tissue that is lighter in weight than the page being mended. This way the mend will not be too bulky and will not cause the paper on either side of it to break. Another consideration is the level of moisture that can be introduced to paper that does not have a great deal of absorbency and strength due to being coated and/or heavily processed. 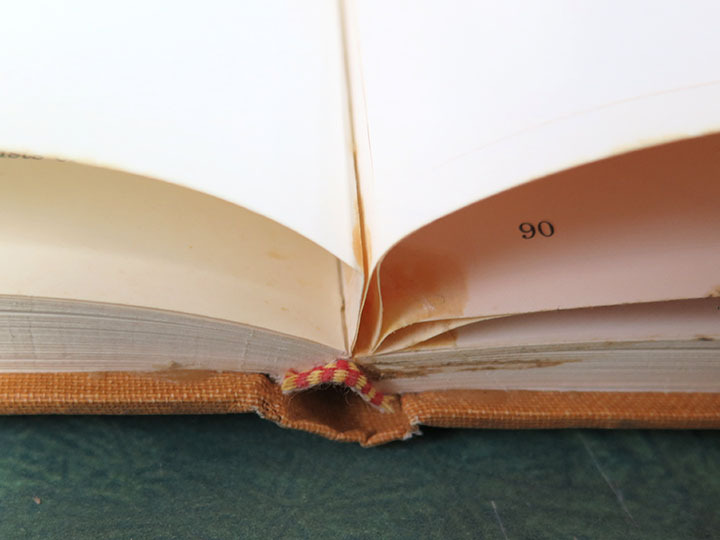 The mending of these pages would require a low level of moisture in the repair adhesive. And of course, protective housing enclosures will do a world of good for these limp and fragile ephemeral objects. I look forward to sharing more about the treatment of the magazines as I move forward through the steps of the process. Please stay tuned, dear readers! “Peel and stick” are very bad words in the world of books. We know these as adhesive labels or sheets to correct errors made by editors and publishers. 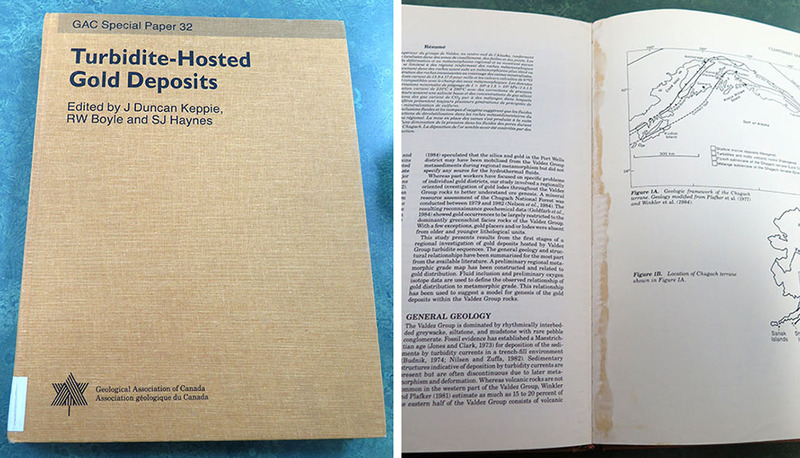 I haven’t seen one in a while, but this time I found two old sheets as replacement pages in the book Turbidite-Hosted Gold Deposits, GAC Special paper 32, 1986. This book came to me after a recent mini-water disaster of roughly 1,000 books here in the Parks Library. The book survived the water disaster very well; however, its old adhesive pages had not. 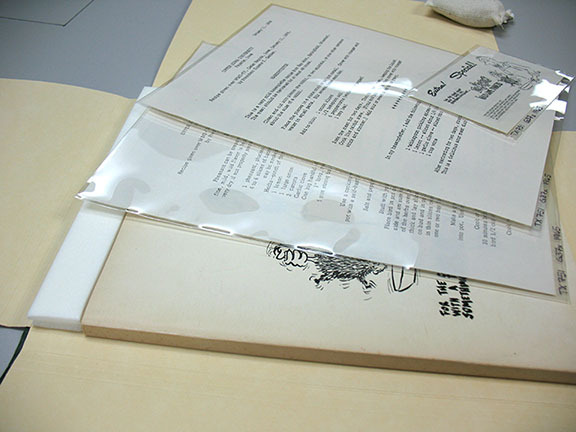 There were two “replacement pages” in large sheets that had been inserted as corrective pages for errata, and over time the adhesive had stained other pages, come apart in some areas, and also was very sticky in other areas. The old “Fasson Crack’n Peel Plus” was failing in several areas. To remedy this, I will remove the two adhesive sheets, photocopy the pages onto acid free paper, and tip them in. I cannot remove the yellow stains on the other pages but can scrape and clean away any remaining sticky residue. The peel and stick correction seems to be a good idea but in reality is not. 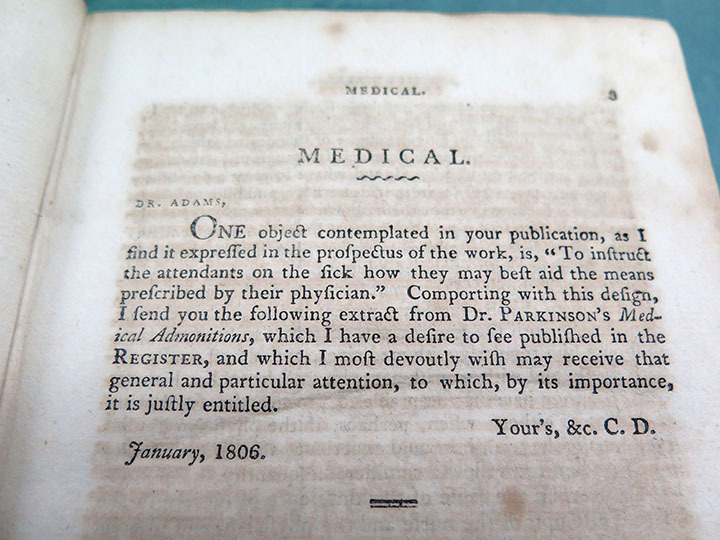 I recently made a box for an old book titled The Medical and Agricultural Register, For the Years 1806 and 1807. 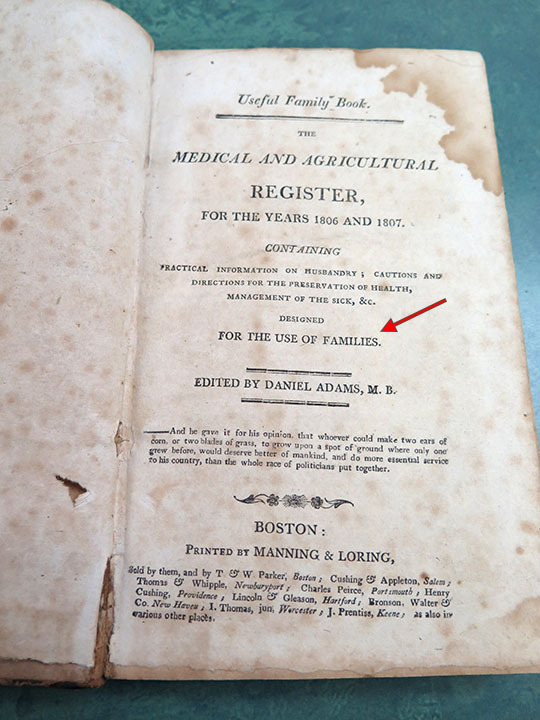 I like the comment on the title page “designed for the use of families.” This book was very interesting, not only in its content, but also in what has happened to the book physically over time. I see that the price of 35 cents had been handwritten in ink inside both the front and back covers. Inside there was some moisture damage, foxing, and staining from the oily printing ink, yet the paper quality is in great shape and has a nice “feel” to it. This book is still in relatively good condition considering it is over 200 years old, and I can handle it without it crumbling in my hands. This is where I get a little misty-eyed thinking of how cool this book really is. Books were made better back then with good materials and strong paper, not like the cheap books that are constructed today, which are pricey and will fall apart easily after a little use and abuse. The books also contains planting and meteorological tables, cider and pickling recipes, more interesting medical treatments and advice, and the “Bill of Mortality for 1806, in 20 Towns.” Just a wealth of information in 1806 and 1807 for a very interesting time, but it makes me happy to be alive in 2015. When you see the work “tux” you may think of an expensive, fancy dress suit for a gentleman. 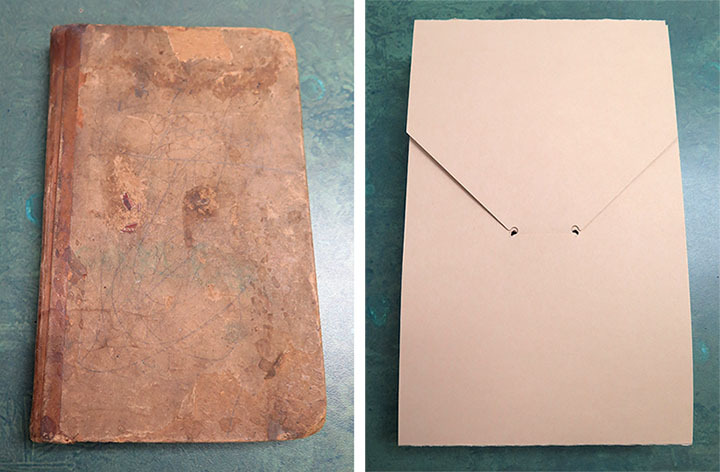 What I think of is a protective, thin box made out of 20 point tan board used to protect a fragile or uniquely structured book. Recently we received a donation of several very old, unique books that need protective enclosures and will be housed in the Cage area. Tux boxing is usually used on thin books where we cannot make a phase box but also a few of these books are thicker in depth and I still chose to do tux boxing because of space limitations in the Cage. Using thinner, 20 point boards means more room on the shelves instead of making a phase box or CMI box. Not all of these tux boxes are heading to the Cage. One is going to the Library’s Storage Building, which also has space limitations, and another is going to the General Collection shelves and just needs a protective wrapping around it. Other times I’ve had to make tux boxes for books that have unique or decorative covers that need protection from the books it will sit next to on the shelves. The tux wrap keeps them from rubbing together and getting damaged. These are nice little boxes that are easy and quick to make in just a few minutes, and provide great protection for fragile and unique books. Think of it as a way of “dressing up” a book! It’s my final week at ISU Library, and I’m feeling nostalgic. Looking back on my five and a half years in the Conservation Lab, there are a few treatments that stand out as particularly memorable. 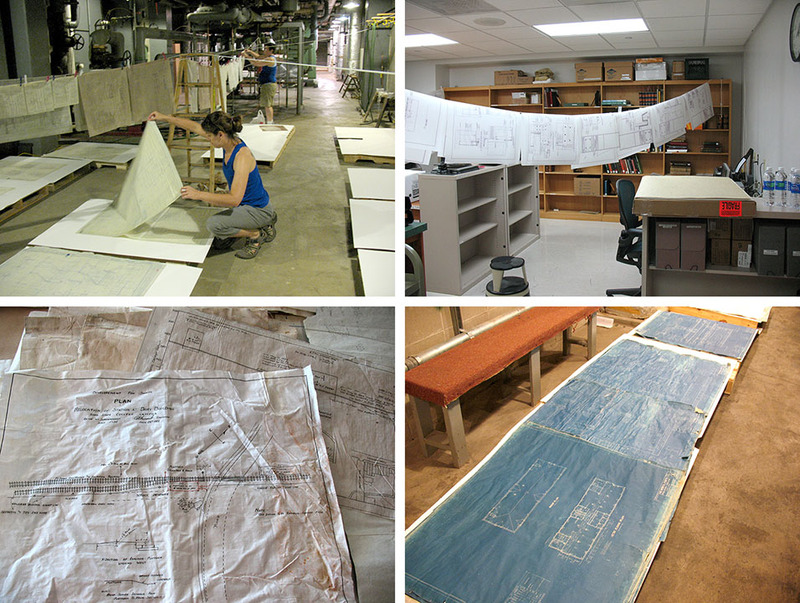 The 2010 flood hit during my first summer in Ames, and strongly impacted the next 18 months in the lab, as we salvaged and treated thousands of flood-soaked documents, architectural drawings, blueprints, and photographs for Facilities, Planning & Management. 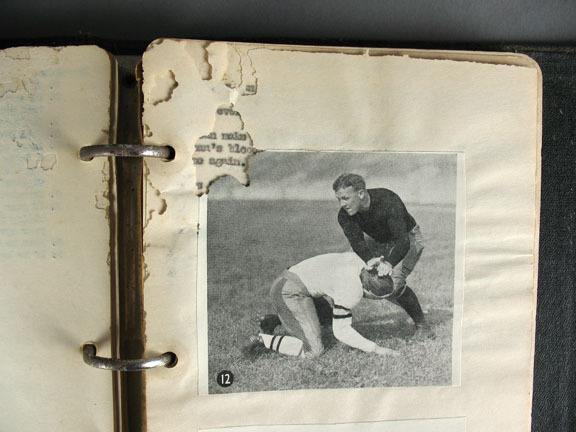 In 2011, this ISU football manual from the 1930s landed on my bench. I enjoyed the challenge of trying to preserve the original structure of the 3-ring binder, while also giving the acidic and insect-damaged pages some support. You can read about the treatment in my original post. In 2012, I worked on another football-related conservation treatment, the housing for the last letter written by Jack Trice. 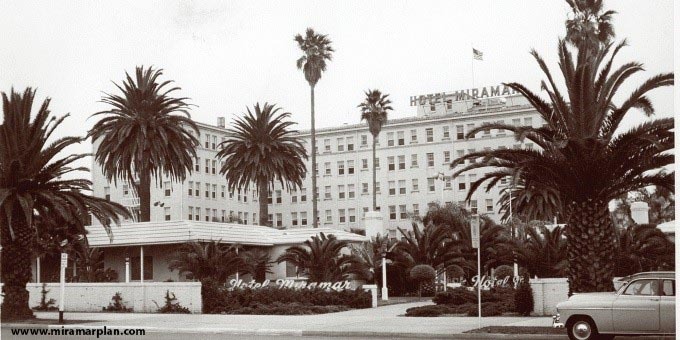 He wrote the letter on hotel stationery in 1923, on the eve of his first major college football game, during which he sustained fatal injuries. The double-sided letter is suspended in a Mylar window in this portfolio, so both sides can be read. The last letter written by Jack Trice in 1923, on the eve of the college football game in which he was fatally injured. The original letter is housed in ISU Library Special Collections, but we also created a facsimile which I bound into a custom enclosure decked out in Cyclone colors for Coach Rhoads to take with him on recruiting trips. 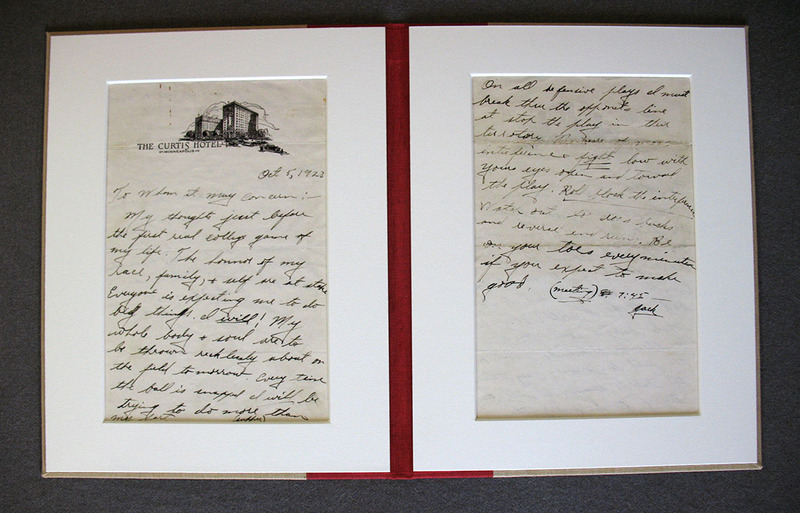 Facsimile of the last letter written by Jack Trice. 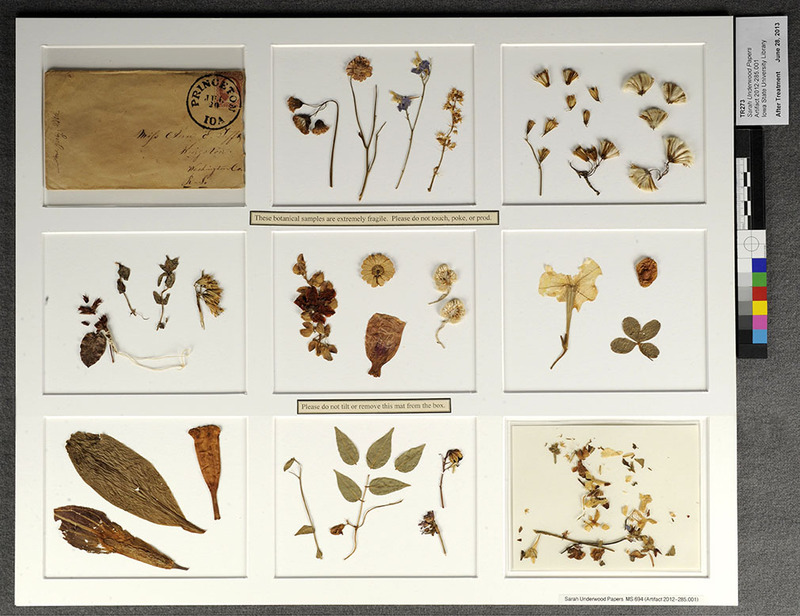 In 2013, I thoroughly enjoyed working on a display rehousing for unclassified botanical specimens in the Sarah Underwood Papers. In 2014, a new acquisition came to the lab with a curling, brittle paper label. I ended up resewing the textblock and rebacking the spine. This project was a particular pleasure because the sewing structure was a bit of a mystery to unravel, quite literally. It turned out the volume had been sewn five-on, five-on, seven-on, seven-on, five-on on four support cords. 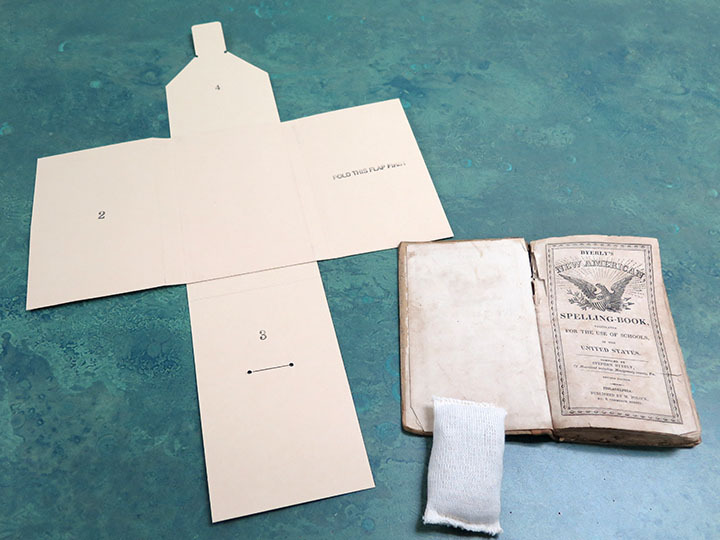 This method would have saved time and money for the bookseller, and was in keeping with the humble paper retail binding. I resewed following the original pattern. 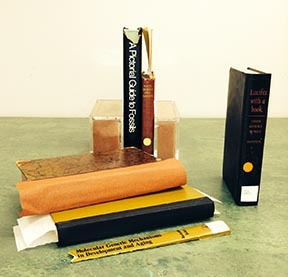 And finally, just this month, I finished a full leather rebinding of a 1579 Italian imprint of Garcia de Orta’s Aromatum et simplicium aliquot… The book came to us bound in a typical eighteenth-century English style tightback binding covered in acid-sprinkled calfskin leather. Although the binding style was anachronistic with respect to the textblock, it told a story of the volume’s provenance, so I was hesitant to remove it. However, the volume had been oversewn and had some tears and sloppy hide glue repairs that made the book virtually unusable. I disbound the volume, removed the hide glue accretions, and mended and guarded the damaged pages. Then I rebound it in a manner sympathetic to the imprint’s sixteenth-century Italian origins by resewing on alum-tawed thongs with made endpapers of Italian handmade marbled paper. I sewed on silk endbands, and laced on boards built up from layers of paperboard. I covered the volume in edge-pared goatskin leather, working around the bands to give the appearance of a tightback, but in fact allowing a hollow on the spine when the book opens. 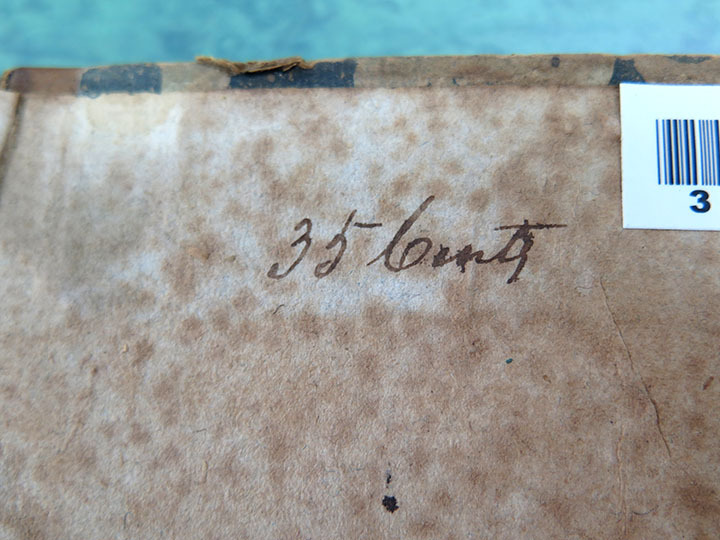 According to Bernard Middleton, spine labels were not used before 1600 in Europe, although titles were sometime blind-tooled directly on the spine. However, most spines were left blank, and this is what I chose for this volume, since it would be housed in a cloth-covered clamshell box along with its previous case (which was given a foam insert for support). 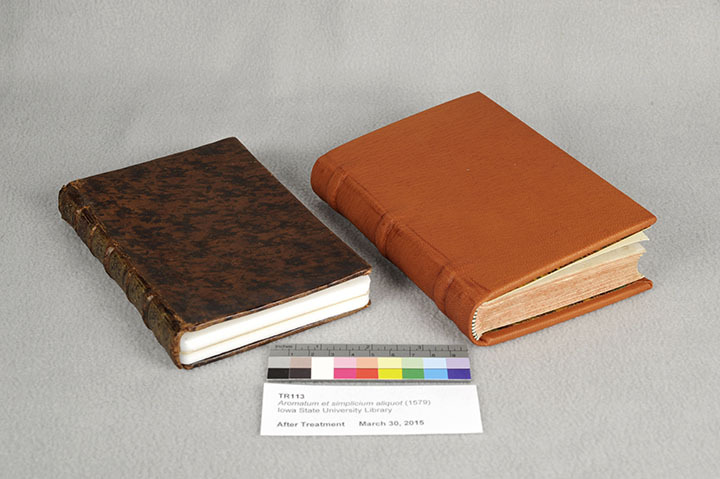 Previous binding (with foam insert) on left; rebound volume on right. 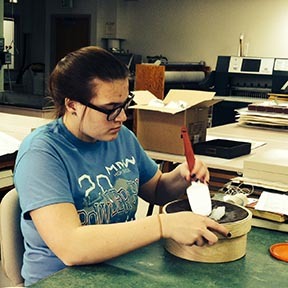 Benchwork has been only one part of the enriching professional activities I have enjoyed during my tenure as ISU Library’s Conservator, but it has been a fascinating and deeply rewarding part of my work. One important part of my job is to train new student employees, but one of my highlights is to teach book repair skills to others such as Gloria Diez, one of our 2014 Lennox Interns. 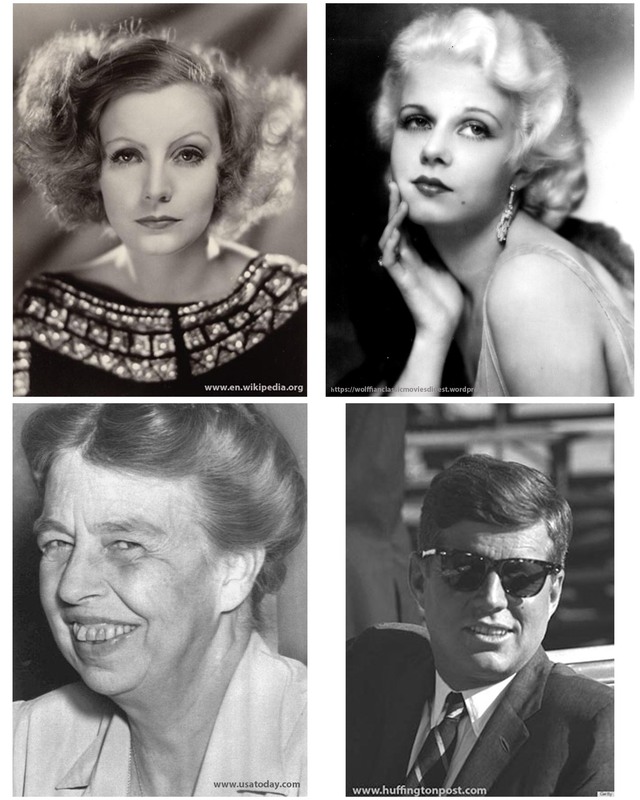 Gloria was our intern for Audiovisual Preservation, so she had no prior book conservation experience. 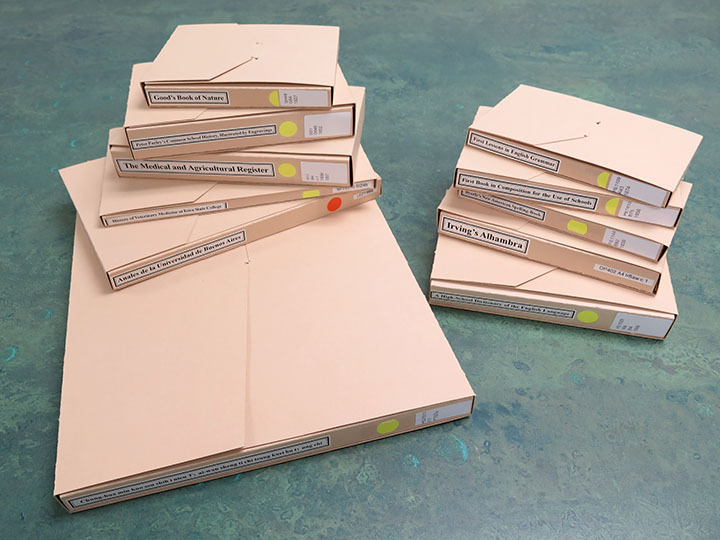 We designed her internship to include book repair and basic paper conservation, because these are useful skills for dealing with ephemera and other print materials when working in a film archives. 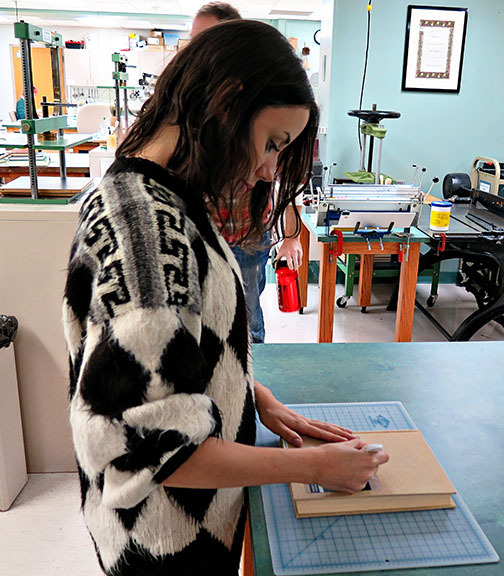 Not all of our students and interns come with book repair knowledge or skills, so it can be a challenge when explaining and showing how to do a full repair to a book, or to construct a phase box. When our students or interns have a hobby such as origami, sewing, knitting, or drawing that requires some hand skills, all the better. And if they are a quick and eager learner like Gloria, it makes it fun for me, too. Gloria adheres a label on a repaired book using a Teflon folder. 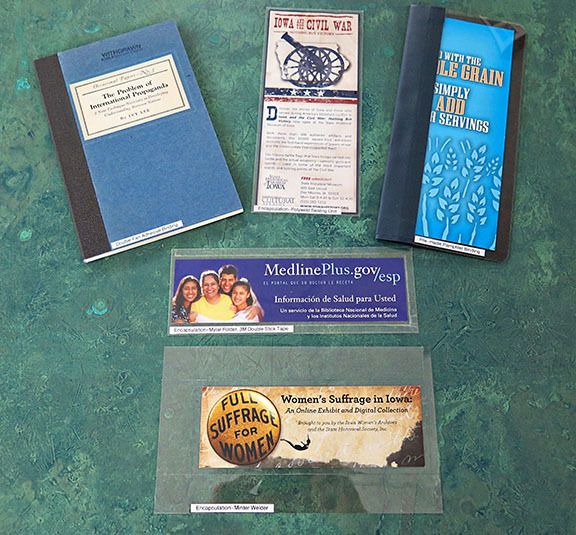 We first started with the basics of simple enclosures such as pamphlets, CoLibri pockets, and encapsulation with Mylar using bookmarks, folded pamphlets, and other non-collection materials. When we worked on rebacks, recases, full repairs, and new cases, we used discarded library books so Gloria could take all her samples with her when her internship was completed, as a 3D portfolio of her repair work. Then Gloria learned how to make phase and tux wrap boxes to house her repairs in. Gloria uses the Minter ultrasonic encapsulator. This one-on-one time with Gloria also gave me a chance to learn a little more about her. All Lennox Interns time must come to an end and it’s sad to see them go, but I’m glad to give a little of my talents at book repair in order to aid Gloria in her future endeavors. Good luck Gloria! 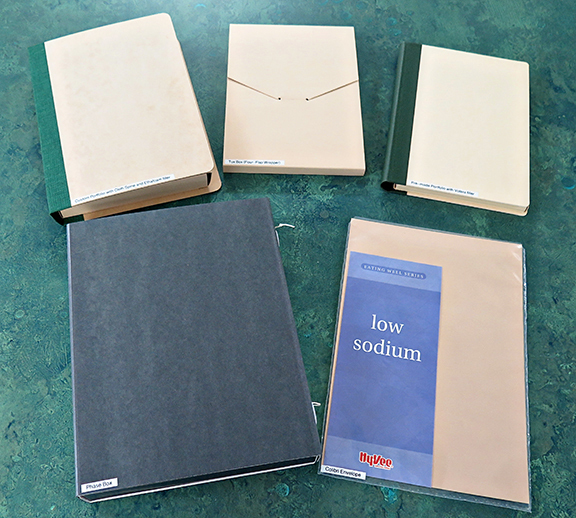 Gloria’s custom enclosures for the repaired books. 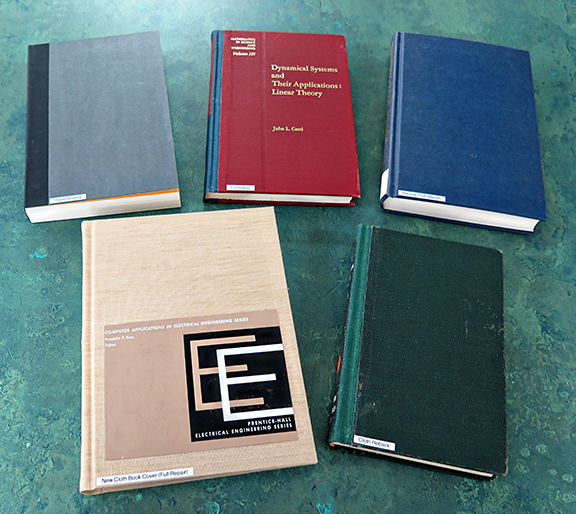 Gloria’s other treatments (pamphlet bindings, encapsulations). Custom enclosure for booklet and encapsulated ephemera, with foam insert.